The definitive architecture of the mammalian body is established shortly after implantation of the embryo in the uterus. The antero-posterior, dorso-ventral and medio-lateral axes of the body become organized under the control of gene networks that coordinate the transcription of DNA in various regions of the embryo. Researchers from the University of Geneva (UNIGE), the University of Cambridge, UK, and the Federal Institute of Technology Lausanne (EPFL) now report the ability of mouse stem cells to produce pseudo-embryos that display similar capacities. Established from about 300 embryonic stem cells only, these structures, called gastruloids, show developmental features comparable to that of the posterior part of embryos aged from 6 to 10 days. The study, published in the journal Nature, shows that the three main embryonic axes are formed according to a gene expression program similar to that of embryos. Gastruloids thus possess a remarkable potential for the study of the early stages of normal or pathological embryonic development in mammals. Studying the processes orchestrating the formation of early mammalian embryos is hampered by the difficulty in obtaining them. The team of Alfonso Martinez Arias, Professor at the Department of Genetics of the University of Cambridge, UK, recently discovered that, under certain conditions, murine embryonic stem cells can assemble into three-dimensional aggregates that keep elongating in culture. These entities called "gastruloids" display different characteristics of early stages of embryonic development. "To determine whether gastruloids organize themselves into bona fide embryonic structures, we characterized their level of genetic activation at different stages of development," explains Denis Duboule, Professor at the Department of Genetics and Evolution of the UNIGE Faculty of Sciences and at the Swiss Institute for Experimental Cancer Research of EPFL. The researchers identified and quantified the RNA transcribed from gastruloids and compared the expressed genes with those of mouse embryos at comparable stages of development. 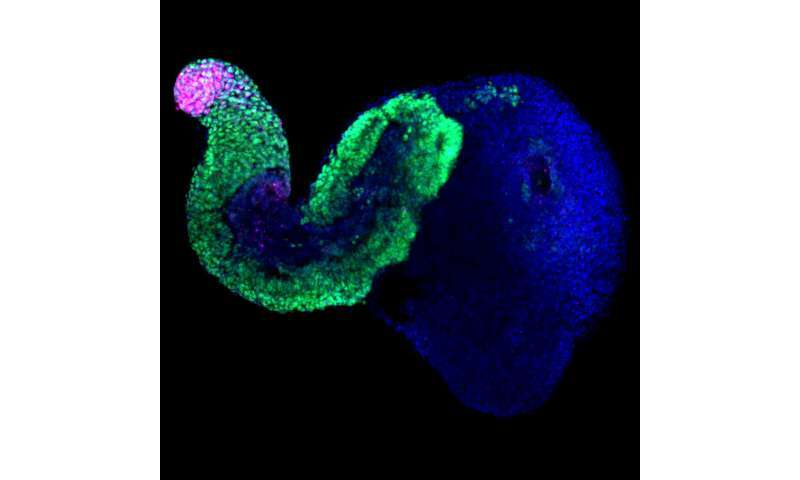 "Gastruloids form structures similar to the posterior part of the embryo, whose development program is somewhat different from that of the head," says Leonardo Beccari, scientist in the Geneva group and co-first author of the study. These pseudo-embryos express genes characteristic of the various types of progenitor cells necessary for the constitution of future tissues. "The complexity of gene expression profiles increases over time, with the appearance of markers from different embryonic cell lineages, much like the profiles observed in control embryos," notes Naomi Moris, scientist from the Cambridge team and co-first author of the article. During the formation of the gastruloids' antero-posterior, dorso-ventral and medio-lateral axes, members of these teams could visualize an amazing property; the 'architect' Hox genes, which are normally activated in a precise sequential order in the embryo, were equally well activated in gastruloids grown in vitro. "The implementation of the Hox gene network over time, which mimicks that of the tail of the embryo, confirms the remarkably high level of self-organization of gastruloids," explains Mehmet Girgin, geneticist at EPFL and co-first author of the study.